As the amplifier circuit also uses a number of frequencies to drive the loudspeaker, the bass frequencies will be reduced. 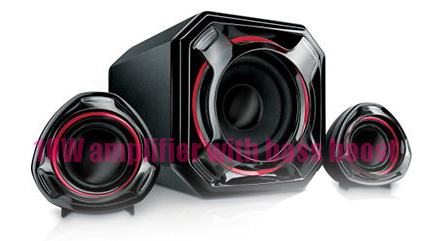 Therefore need to be plugged the bass-boost control at fedback loop amplifier, this is done to overcome the decline in quality. Graph bass can reach a maximum at +16.4 dB @ 50Hz. 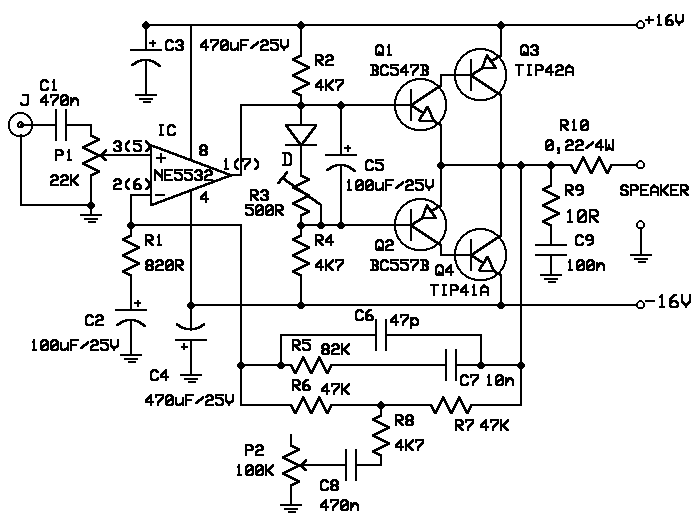 This circuit can be connected directly to the CD player, tuner, and tape recorders. Q3 and Q4 must be in pairs with a heatsink. Adjust the volume control at minimum position and R3 with a minimum value of resistance as well. try enabling circuit R3 da set up to read the flow of about 20 to 25mA. Wait for 15 minutes, connect the ground at J1, P1, C2, C4 C3dan. Connect also C9 at the output ground. 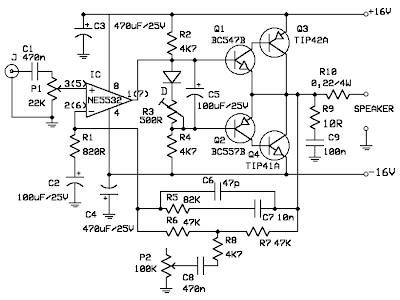 For his series of power supply you can use the following scheme that fits perfectly with this amplifier.